Bitters (Gentian Root) – Long Dan Cao: the major component of bitters, a common cocktail additive, is Gentian Root. Gentian Root is an herb used in ancient Chinese Medicine to clear damp-heat from the Liver and Gallbladder system, which is actually perfect when being consumed with alcohol. But bitters extractions can be helpful on their own, especially for those detoxing from alcohol and other toxins, or when cleansing the Liver/Gallbladder. Black Sesame Seeds – Hei Zhi Ma: these are an amazing Kidney tonic. A few tablespoons can be steeped just as tea would be, enjoy the strained liquid. You can also grind them up and add them to smoothies, or toast them and add into cooked rice/on top of salads. Chinese Yam – Shan Yao: easily found at a Chinese grocery store, these are great for tonifying Spleen qi, which means improving digestion and energy. Most other varieties of sweet potatoes and yams have a similar effect. Cinnamon Sticks – Rou Gui: warms the interior for those with cold conditions. Clove – Ding Xiang: especially aromatic, this herb is particularly effective for moving qi in the digestive system. It can be used to subdue nausea, warm the digestive organs or stop hiccups. Dandelion – Pu Gong Ying: this very bitter and green herb is especially effective for draining the liver of toxins and clearing heat form the body. Those undergoing a cleanse or detox usually find eating dandelion greens or drinking dandelion tea quite effective in aiding the cleansing process. It also has antibiotic and antiviral properties so it is especially effective during times of a nasty infection or virus. Fenugreek – Hu Lu Ba: this is a common herb in some culture’s cooking. It has a distinctive maple syrup-like flavor, if added to an herbal formula or tincture it adds a lovely sweet flavor. It can move qi and improve digestion, but is most known for its use as a galactagogue, which means it is an herbal substance that can help bring in breast milk. Galangal – Gao Liang Jiang: this herb is very hot in nature. It is commonly used in Thai soups like Tom Kha Gai, and is used medicinally when patients are suffering from very cold conditions. It is related to ginger but much warmer in nature and should be treated differently. Ginger – Sheng Jiang: helps descend stomach qi which means it helps settle an upset stomach and reduce nausea. Ginger also helps to release wind-cold which means it can help with many instances of common colds. Green Onion – Cong Bai: especially effective for releasing exterior-wind-cold, which means they ward off a common cold or build immunity to defend against it. Green garlic and dried garlic can have a similar effect on building immunity against seasonal pathogens, especially when brewed into broths or teas. Hemp Seeds – Hou Ma Ren: these have become very popular in the health food realm as of late because they are rich in omega- 3 and 6 oils, but in Chinese Medicine they are the herb of choice for constipation in old age, simply make a tea from the seeds. Honey – Feng Mi: this is considered a qi tonic, which means it can promote digestive energy to those who are particularly deficient. It is also moist in nature so it can be taken for a dry cough or constipation. Jujube – Da Zao: also known as Chinese Apple or Chinese Date, these are easily found at Chinese herbal or grocery stores, and can even be found at some farmers markets. In California, we can find them fresh in Autumn. These are a widely used tonic in Asia, which are added to almost every herbal formula because of their ability to aid in digestion of any other herbs. 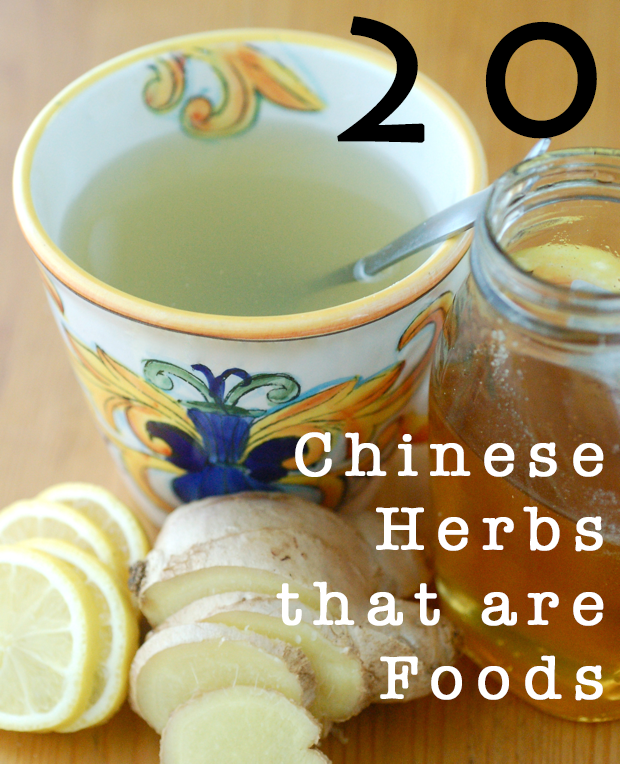 They are most often paired with ginger, the two brewed together in some water make a very tasty tea. Longan – Long Yan Rou: a fruit which can easily be found in Asian markets, especially in its dried form. It has a smokey flavor when dried and is especially effective for calming shen, which means it sedates the mind and assists in cases of anxiety, stress and mental fatigue. It is excellent as a snack during the postpartum period. Malt (Barley Sprout) – Mai Ya: malt, which is a common addition to milkshakes, helps improve digestion. It is the sprout of the barley grain, which is rich in digestive enzymes. Commonly used in Chinese Medicine, it reduces food stagnation and strengthens the stomach, which is why it is used to treat many different digestive disorders. Mandarin Orange Peel – Chen Pi: many different citrus peels are used in Chinese Medicine to reduce phlegm and regulate digestion. They can be a bit bitter and sour, thus harsh on the stomach, so to it helps when they are brewed into tea to add some quality honey, which will protect the lining of the stomach. Mint – Bo He: in Western herbal medicine mint is often used to settle an upset stomach, but in Chinese Medicine we prize mint more for its ability to circulate Liver qi. This means that it can move stagnant Liver qi which may be due to stress, pain, hormonal imbalances or anger. Of course it can also help an upset stomach, but it does so much more. Nutmeg – Rou Dou Kou: this herb is especially effective for stopping diarrhea. It is toxic in large amounts so a little goes a long way. Rice – Geng Mi: this herb is used as a base to cook many other herbs in. Rice is a simple tonic which is very easy to digest. If you need to take other herbs which are not as easy to stomach, cooking them with rice can make them much easier to digest. Walnut – Hu Tao Ren: walnuts have been proven to have oils that are beneficial to the brain and nervous system. In Chinese Medicine foods that look like body parts have long been used to treat those body parts, which is why walnuts have been used for thousands of years to benefit the brain. Part of what makes Chinese Medicine so effective is its ability to determine a differential diagnosis and treat accordingly. This diagnosis depends on a patient’s current condition which we often determine based on looking at their tongue and feeling their pulse. If you are interested in receiving nutritional consultation based on your Chinese Medical diagnosis, call us today at 818-392-8797, send an email to float@chinesemedicalarts.com, or find a Licensed Acupuncturist in your area at acufinder.com. As a busy working mom committed to serving my family real food at every meal, avoiding processed foods and eating organically with the seasons, I often rely on the slow-cooker for dinners. There’s nothing quite like realizing it’s 5:00 pm, we’re all cranky and hungry, and dinner is already ready. It’s much easier to make a side of brown rice or quinoa and steam or saute a side of veggies, and serve it along with a slow-cooker meal, than it is to plan a meal from scratch at 4:50pm. Here’s a slow-cooker dish I came up with on the fly yesterday morning, when I realized it was 7:00am, I had no plan for dinner, and we all had to be out of the house for the day. I picked some fresh herbs from our garden (while still in my PJ’s), and chose organic chicken thighs because that’s what I had fresh in the fridge. You could easily substitute chicken breasts if you prefer. 1) Whisk all marinade ingredients together in a glass bowl. 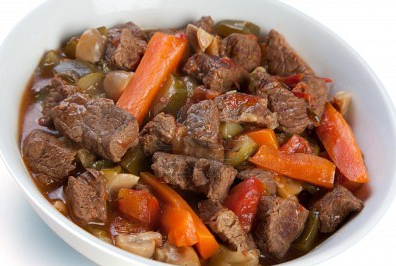 2) Place the potatoes, onions and carrots at the bottom of the slow-cooker. 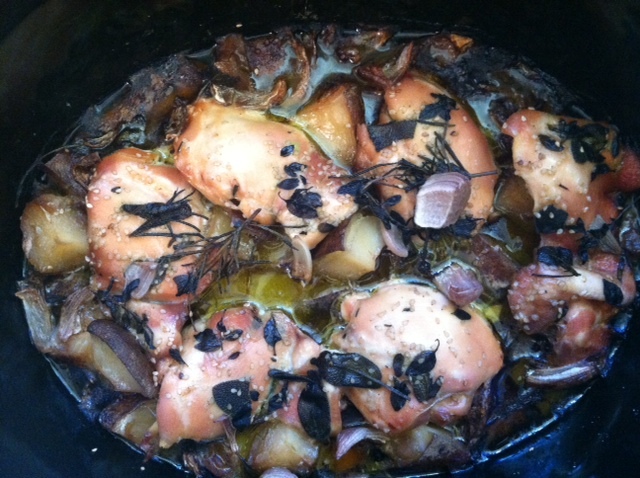 3) Put the chicken thighs on top of the vegetables. 4) Pour the marinade over the chicken and vegetables. 5) Sprinkle the sesame seeds & sea salt over everything. 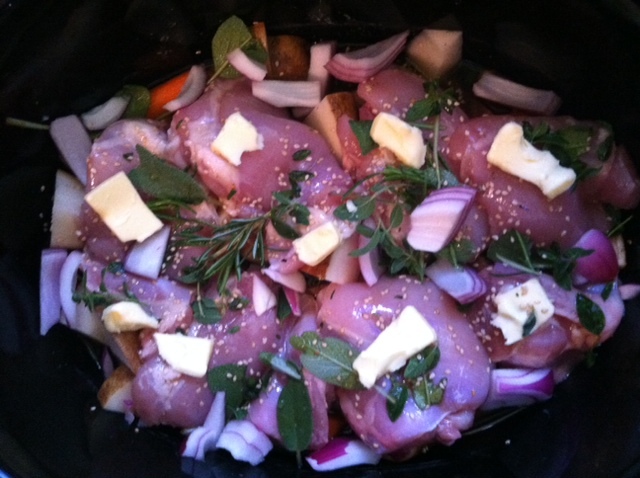 6) Tuck the fresh herbs between and on top of the chicken thighs and vegetables. 7) Place one pat of butter on top of each chicken thigh. 8) Turn the slow-cooker on LOW for 5 hours. 9) Serve over brown rice or another grain of your choice. I also served with a side of sauteed fresh zucchini, which is what was ready for picking in our garden. Try making this for your family, and let us know what you think! We often get patients asking what they can eat to reduce Brain Fog. Whether you are a sleep-deprived new parent, you work at a desk for hours on end, or just have trouble focusing – who doesn’t? – these foods are high in good fats and Vitamin D, which can help the nerve cells in your brain work to the best of their ability. Go ahead, eat up! In Traditional Chinese Medicine, every organ system has a color and a season. The Liver is green. Spring green. 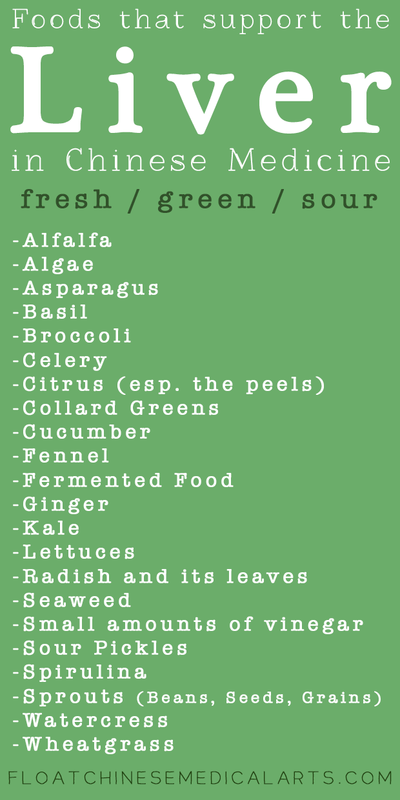 April and May are great months to focus on adding cleansing foods into your diet to help your Liver work better. When the Liver works better, we feel less stressed and irritable, we lose excess weight, sleep better, and aren’t bothered by headaches or PMS. Try some of these yummy Liver-nourishing foods and see how good you feel! Check back here often for more posts on foods that benefit the 12 Organs.